The Association of State and Provincial Psychology Boards (ASPPB) offers the Examination for Professional Practice in Psychology (EPPP) for licensure and certification. For this test candidates are given 4¼ hours to complete 225 questions. The EPPP exam raw score will be converted to a scaled score in the 200-800 range, in order to account for different questions having different levels of complexity. To pass, ASPPB advises a minimum of 500. Most jurisdictions use this minimum score, but check with the local jurisdiction to find out the applicable standard. If a candidate is unsuccessful in the attempt, he or she may re-take the assessment, but candidates are not allowed to do so more than four times in a year. There is not a mandatory waiting time between tests, unless the local jurisdiction has this requirement, but it is advisable to let about 60 days go by in between attempts in order to properly prepare. Biological foundations for behavior (11%) – Biological and neural foundations for behavior, psychopharmacology and sustaining techniques. Cognitive-affective bases of behavior (13%) – Cognition and its neural foundations, premises and observed foundations for learning, recall, incentive, affect, feeling, and executive function, and elements that sway cognitive acts and/or emotional experiences and their dealings. Social and multicultural bases of behavior (12%) – Intrapersonal, interpersonal, intragroup, and intergroup courses of action and forces that cause change, premises about personality, and matters of diversity. Growth and lifespan development (13%) – Age-appropriate maturity through life stages, unusual patterns of development, and the defensive and hazard dynamics that sway developmental results that people experience. Assessment and diagnosis (14%) – Psychometrics, evaluation models and tools, ways to evaluate preliminary condition of and alterations by individuals, couples, families, groups, and organizations or systems, and diagnostic classification organizations and their limitations. Treatment, intervention, and prevention (15%) – Individual, couple, family, group, organizational or community interventions for particular issues or problems in diverse people, intervention and prevention theories, best practices, and consultation models and processes. Research methods and statistics (7%) – Research design, methodology, and program assessment, tool choice and substantiation, and statistical models, best guesses, and measures. Ethical, legal, and professional issues (15%) – Rules for ethics, professional standards for performance, laws and limitations, ways to make ethical choices, and proficient teaching and administration. What must children do in Erik Erikson’s “Industry versus Inferiority” crisis? In cognitive-development theory, Lawrence Kohlberg says that “gender typing” emerges during cognitive development. At what age would a boy know he’s a boy? it addresses genetic links to schizophrenia. it is the only major lifespan theory of normal development. it is the only major lifespan theory of abnormal development. it combines all previous theories into one concrete theory. What does the cephalocaudal principal state? diagnostic tools for determining mental illness. a series of projective tests. A: Learn the skills of their culture. Industry versus inferiority is Erikson’s fourth crisis. Crisis three is referred to in B, while C relates to crisis one and crisis two aligns with D. During this period of development, children learn through family, school, and others how to adapt to the culture they reside in. If a child cannot learn these skills, the child is likely to feel inferior. D: Age two or three. According to Lawrence Kohlberg, children categorize themselves as a particular gender around this time. They do more than observe the behavior of others or merely respond to a reward/punishment system. By age two or three, a boy knows he’s a boy and feels secure in his gender identity. However, it isn’t until age five to seven that “gender conservation” occurs, which is when he not only knows he’s male, but realizes he will always be male. B: It is the only major lifespan theory of normal development. Further, Erik Erikson’s theory of psychosocial development is the only theory of normal development to cover not just a portion of the lifespan, but the entire lifespan. He used Freudian theory and then built upon it, adding the impact of social influence upon an individual’s developmental processes. Covering eight stages and four crises, Erikson’s theory takes developmental theory all the way from birth to death. C: Development proceeds from head to toe. Even though there is a broad range for what is “normal,” upper portions of a child’s body tend to develop before lower parts. Alternately, the proximodistal principle dictates that development progresses from near to far. An example of this would be that a child demonstrates control over the arms and legs before fingers and toes are mastered. A: Wechsler scales. David Wechsler developed his IQ test because he felt the Stanford-Binet was too heavily oriented toward children. The Wechsler scales include three separate tests, each given according to age group. The WAIS is for adults, the WISC for children aged 6-16 and the WPPSI focuses on children aged 4-6 /12. Each test includes “verbal” and “performance” subtests and culminates in providing an IQ score relative to the age group. 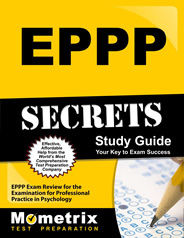 Ace the EPPP test using our EPPP exam study guide with practice questions. 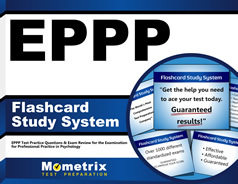 Quickly Solve Difficult EPPP Test Questions with the EPPP Flashcard Study System.